How many degus can be maintained at a certain cage size, it is ultimately also depends on how well the cage is set up, the age of the degus, whether and how often they get freewheel. Ultimately, applies when choosing a cage: the bigger, the better. A self-made cage completely stable 1x1cm grid (grid Vogel / not to be confused with chicken wire can easily gnaw through the degus), although providing sufficient air exchange, but also the spread and the uneaten food falls out. the around consists of grid also at a bird aviary. The dirt falls out and the degus will take your last nerve by always gnaw at the bars. Tip: If you already have a cage of mesh call their own, it is recommended that a 10cm high Plexiglas plate at the base of the cage to bring the reduces the falling out of the muck. Glass terrariums or homemade cages with plexiglass plates intrinsically safe therefore best for degus. A louver must of course be scheduled, at best, on the lid and in the bottom third of the cage. If the cage be equipped with wooden floors, it is recommended a layer of clear lacquer toys / baby paint on the floors on to wear. Toy paint / Baby Paint is an absolutely harmless, solvent-free and robust paint. The degus do not take on health when they eat into the boards or floors. My cage boards are all made of compressed wood boards (OSB) from the hardware store, the boards are robust and my previous generations Degu found no fallen at the Zernagung the boards. My first cage can be seen on the following pictures, information about my current cage, see information for breeding - Our cage. Conclusion: Those who prefer to buy a ready-made cage , I recommend a glass terrarium or OSB Terrarium . There are already terrariums the levels incorporated have ( as of Terra Ott ) . Also suitable are terrariums / aquariums with mesh sides . The size of 100 x 50 x 100 cm ( L x W x H ) should never be less for 3 Degus! Degus run several kilometers every day in nature, therefore they need a very spacious cage with a large base. Per animal a continuous surface must 0.5m² available of mind. minimum dimension: 120 x 60 x 80 cm (L x W x H) (base: 0.6m² tread: 1.2m²) with ground + 1 Full day for max. 2 degus. The Veterinary Association Animal Welfare is an absolute minimum size of 100 x 50 x 100 cm (L x W x H) for 2 degus (as of 2011). Low standard: 120 x 50 x 100 cm (L x W x H) (base: 0.6m² tread: 1.8m²) with ground + 2 Full levels for 2-3 degus. Or 120 x 60 x 100 cm (L x W x H) (Area: 0.72m² tread: 2.16m²) with ground + 2 Full levels for 3-4 degus. The cage should be only in a draft-free room, which should be bright and well tempered. The cage must not stand next to a radiator or in bright sunlight - risk of overheating! At eye level or just below it degus feel most comfortable. Commercially available small animal cages are not suitable for degus because degus quickly gnaw their plastic , thin wood or metal . Particularly cages with plastic tub is not suitable , by the gnawing plastic particles can be swallowed , which may cause a serious disease . The cage must be equipped with several levels in order to ensure an optimal utilization of the space . Branches, roots , stones , clay pipes , Korkstücke- / tubes , house and other hiding places make the cage varied and provide a constant wear of the teeth and claws . As litter received my degus Buchholz litter and bark with different types of About Trust - Herb Land - Woods & Meadows - Heathland - forest floor - Hardwood & Softwood ( 1-2 packs per cage about 2-5 cm high ) . This scattering includes once Nage material as well as supplementary feed . Also useful is hemp litter , the manufacturer can be chosen freely. Buchholz granulate Vitakraft Wood - Mix Nature , Chipsi small animal bedding Forest Fresh , Vitakraft About Faithful, hemp straw, bark bedding, linen straw , flat bedding u.v.m. Degus digging in the wild underground passages , so has the cage sufficiently high base tray , then you can with a small aquarium integrate a burrow in the cage . The aquarium can be filled with a mixture of sand and peat , which is slightly moistened , so that it applied courses remain stable . Also mulch can be placed in the burrow . One recommendation is the use of Terrarienhumus , humus substrate , or the materials used in terrariums in coconut bricks , they are sterilized and are sold in dried, compact compressed form . After the addition of water results in a greater amount of soil . A wholly owned recommendation for the content of the burrow at degus do not exist, but it must the content be taken fertilizer free , fragrance-free and is sterilized. Degus are very clean animals , so a container with chinchilla sand them must always be available where they wallow and thus can carry out their grooming . Degus should be " bathed " only in cases Healthwise necessary in water , their fur attracts moisture and therefore degus would catch a cold quickly. Suitable each chinchilla sand . * Although attapulgite is considered a suspected carcinogen , but if the bath sand is used as the small animals only in small amounts , it can not be confirmed an adverse effect , according to the Tierärtztlichen University Hanover . The diskutirte in the media suspected cancer can be attributed to far greater amounts , in which the sand is direckt processed and thus inhaled. Basically all Feinstaube If inhaled in large quantities , to cause cancer , thus normal house dust . When the construction workers in Attapulgus can not be discounted on this problem , in the small livestock rather." ** bird sand consists mainly of quartz-bearing sand , which sometimes crushed fragments of shells ( so-called grit) , mortared Grit and anise oil are added . My degus run on Quartzite Flagstones or slates and additionally have rose quartz raw stones in the cage . Many stones such as Rainbow stone with the typical round holes are not real natural stones but polyresin replicas . The basis for the production of artificial stones forming a special plastic that has been strengthened in most cases with glass fiber ( GRP Rock ) . Degus have a great urge to move , thus a cog them must always be available . Plastic is gnawed by degus , will result in the death of a swallow degus. Metal wheels were not declared as Artgerecht and are therefore no longer available . However, the wheel does not replace a spacious cage ! While running plates are an alternative , but I stop by their inclination and manner as degus have to run it, not for health or particularly conducive . The currently best choice of a wheel is a wooden wheel with min . 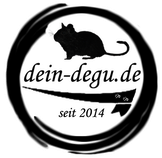 Ø30cm , unfortunately there are some degus but like to eat . However, since my degus are very nagewütig and have therefore already broken some wheel , I have two full - aluminum wheels appointed 0mm distance between the running bars . I opted for a stand stands which means the wheel can be bolted and no longer slips . The all-aluminum wheels are the best buy I could make , I am completely convinced of the quality . Even with fast the degus race in the impeller can not hear anything , by the ball bearing the wheel runs completely silently . For all the worry whether a distance of 0 mm is too tight , my degus have no problem , there has been no paws clamped or otherwise. Even the youth used the wheel ! A wide range of high quality wheels can be found here . Naturally tame degus may get run, with tame it is meant herein that can be captured, the Degu without problems again. The outlet of the degus I would be confined to the room in which also the cage stands. Before the Degu outlet gets to hazards such as Watering cans, ashtrays, filled glasses, candles or other pets are brought out of the reach of degus. Degus nibble also like to once cable / electrical outlets, so it is recommended here that you turn off this vorrübergehen either or blocking the way for degus. Of particular note is to close off the possibilities the degus are behind Cabinets or shelves squeeze (as by books), here you get them difficult to back out. An outdoor enclosure as offered for rabbit / guinea pig in trade is not suitable for degus. The bars are too far apart, so the degus could squeeze through. In degus applies - fits the head by they're gone! If you want the degus still be a way, I recommend the outdoor enclosure to reinforce subsequently with firmer 1x1cm mesh bird grating. Secure the grid this wire to the enclosure. However, the degus should not go unnoticed, as they are good climbers and also dig well in.